A happy walrus, basking in the sun and waving at passersby. 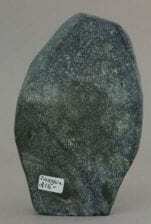 Carved from very dark serpentine, nicely veined. Tusks made from caribou antler. 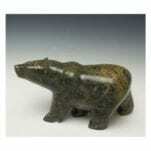 8" x 4" x 2 3/4"
Inuit Sculpture Head Down Walking Bear A handsome walking bear, carved from dark serpentine, by an Inuit artist, likely from Cape Dorset. Head down and to the side gives it an interesting look. Signed P T. 4 3/4 inches long x 2 1/4 inches wide x 3 inches high. 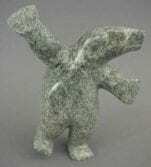 Inuit Sculpture Tall Bear A whimsical bear, carved from hard grey stone, probably basaltic, in a tall, elongated style. 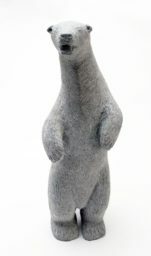 This bear came out of a collection that was built from the during the last quarter of the 20th century. 10 3/4 in. tall x 3 3/4 in. wide by 4 in. deep. 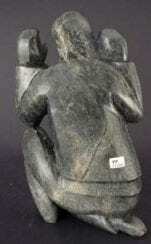 Inuit Sculpture Taqialuk Nuna Bear Family This sculpture, carved by Cape Dorset artist Taqialuk Nuna, depicts a mother bear with three cubs, perhaps in a defensive position. It is a charming work, showing the closeness of a bear family, with cubs of different sizes cuddling up with their protective mother. 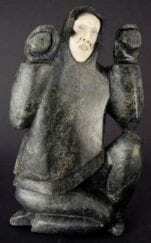 Guide to Cape Dorset Artists, by Kyra Vladykov Fisher, has this to say about the artist, who was born in 1959: "Taqialuq Nuna was eight years old when he started carving. 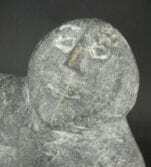 Taq, as he is sometimes called, has taken many courses -- from local prospecting courses to marble carving (in Rutland, Vermont) to a workshop on carving limestone with power tools in Holman Island in 1989. The courses taught him how to work on hard stone and how to cut and dig the stone without breaking it. When he carves a piece that he considers successful, he says, 'it gets me back to nature. 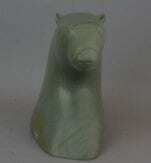 I love to carve bears when they are clustered together. ; they look peaceful'. 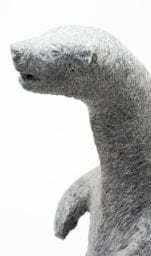 He is known for his groups of bears, usually five together. 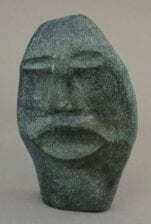 If he carves them on a base it is extremely difficult to get inside to carve the legs." This is a substantial sculpture: 16 in. long x 12 in. wide x 8 in. high. 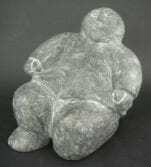 Killiktee Killiktee Walking Bear A chubby, charming walking bear by Kimmirut artist Killiktee Killiktee, carved from serpentine with beautiful color variations. 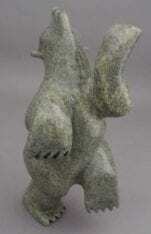 6" Long x 3 1/4" High x 2 1/4"
Pavinak Petaulassie Family Pavinak Petaulassie is a Cape Dorset artist who has recently been carving bird families. He has now turned his attention to human families. This sculpture depicts a family gathered around a fish, presumably the next meal to be shared. Based on the excitement shown, it may be the first meal they have had in a while. Most of the family are wearing traditional clothing, while one individual wears a more contemporary hat, perhaps of European origin. 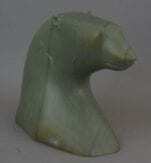 Carved from one piece of serpentine 6 1/2" wide x 4" deep x 4 1/4" high. 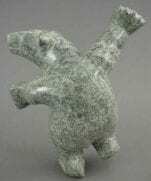 A charming dancing bear by Inuit artist Milleou Ninusuitok of Cape Dorset. 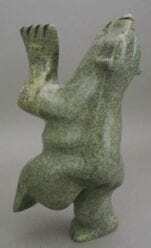 Carved from green serpentine, this bear is happily dancing in a very dynamic pose. 7" x 3" x 3"